A quest to raise funds and awareness about the needs of Hamilton kids led local adventurers and philanthropists on a 30-day hike on the Bruce Trail. Starting at Queenston on the Niagara River and ending at Tobermory on the shores of Georgian Bay, the adventure seekers completed their trek, the Bruce Trail Expedition for Kids, last fall, hiking 885 km and raising over $700,000 for community-based and in-school nutrition programs. Along the route, the trekkers took opportunities to engage students and donors about healthy living, and enjoying and maintaining the Bruce Trail, which is in their own backyard. The four-member team was made up of Mark MacLennan, Teemu Lakkasuo, Fred Losani and Peter Turkstra. 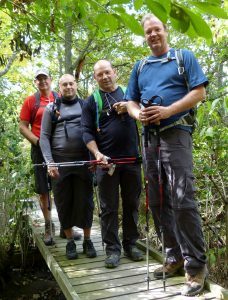 Fred and Peter participated in two previous fundraising adventures. This time, they chose to work with the Hamilton Community Foundation to establish and administer the Bruce Trail Expedition for Kids Fund with the money they raised. Peter says that the goal of the expedition was a good fit with HCF. In addition to local charities that provide nutrition for children, funds raised will also be directed to many other Hamilton charities.